Entrepreneur Magazine recently published an article from 3Pillar CEO David DeWolf. 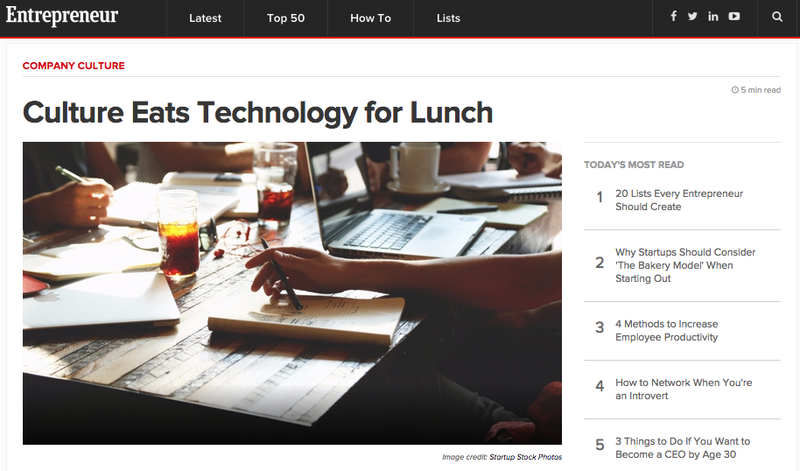 The article, “Culture Eats Technology for Lunch,” discusses what can truly make an entrepreneur innovative, and it’s not always by being the first to jump on a new piece of technology. In the article, DeWolf identifies and explains the most important characteristic of successful companies: culture. “If culture eats strategy for breakfast, as the great Peter Drucker once said, it apparently eats technology for lunch,” he writes. While it can be tempting for entrepreneurs to think of innovation as primarily being the frontrunner in applying new technology, this article asserts that culture trumps all. Entrepreneur.com receives near 13 million unique visitors monthly and is the online home of the print magazine Entrepreneur. The site features a wide scope of articles on starting, running, and growing a successful business. If you’re interested in reading more from 3Pillar CEO David DeWolf, he blogs regularly at DavidDeWolf.com and tweets from @DDeWolf.